The post Meet the players in the BCH Market Manipulation Lawsuit appeared first on CoinGeek. The cryptocurrency world was rocked Thursday by the announcement of a huge lawsuit that was launched by United American Corp. (UAC) against a large number of Bitcoin Cash BCH supporters, including Bitmain and its co-founder Jihan Wu, Bitcoin.com founder Roger Ver, Amaury Séchet of Bitcoin ABC, the Kraken exchange and its CEO, Jesse Powell, as well as a few others. The lawsuit contends egregious amounts of fraud and market manipulation on the part of all defendants and could forever change how BCH is viewed, MarketWatch first reported. The lawsuit and all updates will be available on the www.bitcoincashlitigation.com website. UAC points out in its lawsuit, filed in U.S. District Court for the Southern District of Florida, that the group of individuals colluded to manipulate the BCH network and take control of its functions. The company asserts that BCH has become centralized, which violates “all accepted distributed and decentralized standards and protocols associated with Bitcoin since its inception.” The Florida-based blockchain company further asserts that Ver, Wu, et al worked in conjunction with the Chinese government in order to lead a hostile takeover of the cryptocurrency. The blockchain is meant to be a decentralized solution. To maintain this decentralization, the network operates on a consensus basis that prevents a single person or group from being able to control the majority of the hash, or mining power. If someone is able to control 51% of the network, they can effectively and autonomously decide the blockchain’s fate and this is what the defendants have been able to achieve. Bitmain publicly acknowledged its support of Bitcoin ABC during the hash wars and launched efforts to force the BCH network to follow ABC during the hash wars. It rented hash power and even deployed 90,000 of its own mining rigs in favor of ABC mining operations, a move that can be seen as an attempt to centralize and control ABC. There were also speculations that Bitmain’s Jihan Wu was unloading BTC to fund the ABC mining operations, which, in turn, drove the prices of crypto down. Now, people are wondering if Wu is just cashing out amid the hash war. Meanwhile, the U.S. Department of Justice is also allegedly looking to get involved in the case against Bitmain and Ver’s group through the FBI Cybercrimes Division. Roger Ver is a “crypto anarchist” and has also directed the mining operations of his Bitcoin.com mining pool to ABC. 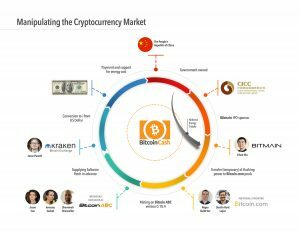 In addition,Bitcoin.com was a recipient of some of the hashing power that was rented by Bitmain in order to support ABC. Ver has direct links to the Kraken crypto exchange through its founder, Jesse Powell. They are friends with a history that dates back to their high school days and Kraken was one of the first exchanges to show favoritism for ABC. It was also the first exchange to declare that ABC was offering the true version of BCH. UAC also asserts that the entities were fundamental in directing hash power—including through the renting of additional mining equipment—during the BCH “hash wars” this month that saw them force the direction the BCH blockchain was headed. The action resulted in an unprecedented amount of hash being processed by Bitcoin ABC backers and further disintegrated the integrity of the BCH network. UAC has been involved in blockchain innovation since 2017 and has invested more than $4 million in the space. It argues that the selfish manipulation of the blockchain is not consistent with BCH’s design, and that it has completely altered the “fundamental economics of the business.” In simple terms, it can be viewed as ordering a Filet Mignon in a restaurant and being delivered a burnt hamburger, while still paying for the Filet Mignon. For a deeper narrative about the scheme, visit the Bitcoin Cash Litigation website. The post Breaking down the United American lawsuit against Bitmain, Roger Ver, et al appeared first on CoinGeek. An amended class action lawsuit alleging insider trading at cryptocurrency wallet and exchange service Coinbase will go to court, after an initial application to the courts was turned down on a legal technicality. The decision, published in court documents uploaded by Coinbase, means the case will be heard on January 31, 2019, in a district court in north California, giving the plaintiffs the chance to put their arguments in front of a judge for the first time. The case concerns allegations of insider trading at Coinbase over its handling of the bitcoin BCH rollout in 2017, which many users had felt resulted in Coinbase staff profiting at the expense of the market. The initial application was rejected in October, after petitioner Jeffrey Berk had failed to “describe the scope or content of Coinbase’s duty.” However, the amended filing now highlights how Coinbase breached its own listing rules, which claimants suggest will now form the basis of their class action. “As a consequence of this scheme, the Individual Defendants and Coinbase enabled Coinbase to earn significant fees from the trades of its customers, from which Coinbase earned a spread over an inflated price for BCH, and to avoid a ‘run’ on the Company by sellers anxious to take advantage of the inflated price, by closing down trading within minutes of the Launch to all except certain insiders who were positioned to and did sell BCH at inflated prices during the Launch,” according to the filing. Coinbase has until December 20 to file a response to the claim, ahead of its court hearing at the end of January. The judge who ruled on the first filing, District Judge Vince Chhabria, accepted that Coinbase had “bungled” the rollout of BCH. The firm has since conducted its own internal investigation, which perhaps unsurprisingly found no foul play. The post Fresh Bitcoin Cash insider trading suit vs Coinbase goes to court appeared first on Coingeek.